When you bake it in the toaster oven, the sugar content hardens, and it transforms into a wafer biscuit that smells of caramel. Sometimes we wonder: Why the hell don’t we live in Japan? Earlier this year, the first Kit Kat specialty store on Earth opened in Tokyo. 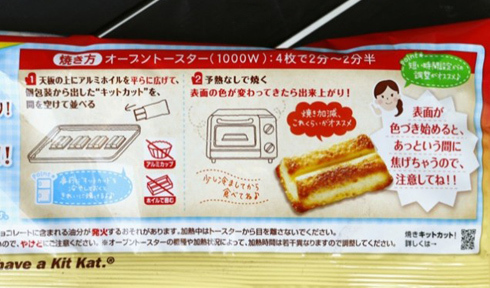 Now, stores in Japan will start selling “Bake ‘N Tasty Mini Kit Kats Custard Pudding Flavor” on March 24th. The new Kit Kat variety is way more awesome than your everyday candy bar. When you bake it in the toaster oven, the sugar content hardens, and it transforms into a wafer biscuit that smells of caramel, reports RocketNews24. The new bakeable candy bar comes in KitKat mini original chocolate and and KitKat mini pudding. Wait just one second—the Kit Kat puffs up and turns into a Pop Tart-ish pastry when placed in the toaster oven? That is nothing less than incredible. The new dessert was created by Japanese pastry chef Yasumasa Takagi, who also opened the Kit Kat specialty store, Kit Kat Chocolaterie in Japan.